An easy, free place, to explore and resource all things related to maintaining, renewing and re-cycling, old, worn jeans with tender loving care. 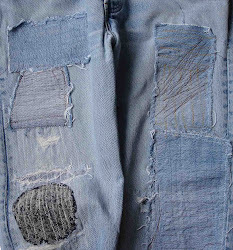 Below are links to ways to patch, mend and re-fashion denim. Denim 101 – this is the essential basic method to seamlessly mend holes in the bud, just before they break open. A technique to patch with printed floral cottons and special vintage scraps. In addition to the tutorial there are several photos of variations. Named "for your eyes only" the original cuff details camoflage the alteration. 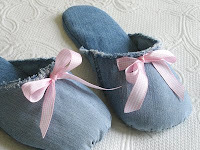 Just discovered this adorable tutorial for a pair of soft baby denim snap-on-pants on craftgossip which led me to the project's orgin - mesewcrazy. Looking forward to a year of creative denim stitching projects. 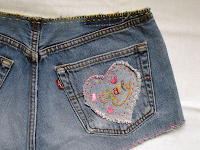 Make your child's denims by adding some cute embellishments by sewing them on your own. You can also put some patches with cute pictures and designs. You can do anything you want and reveal your creativity in your child's jeans. Half price Book Sale ! 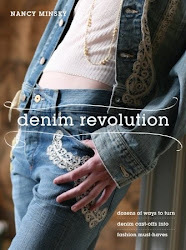 Like browsing through a favorite catalogue, DENIM REVOLUTION, is packed with an easy, fabulous denim wardrobe that you can make yourself from re-cycled jeans ... without the pricey designer price tags. Projects are included for clothing and accessories for casual, dressed up and cozy denim clothing and accessories. Click on the above image to order or go to your favorite online or neighborhood bookstore. Find below some useful denim sewing links. If you can't sew or don't have the time, go to a pro for your repairs. When jeans have truly lost their luster there are many ways to recycle them. Check links below for some ideas. Ahh ... the nine lives of jeans. Do you need new jeans? Then check out these links – from vintage or used to “bread and butter” as well as those irresistible cutting edge designers that develop new shapes and textures. Buy what you love, wear it with joy and re-invent it when its time has come.